Last year when I was living with my daughter in Delft, the Netherlands ( the Netherlands was rated by OECD in May 2011 as the 'happiest country' among the top 34 richest countries in the world), I enjoyed cooking and eating many kinds of European veggies which I've never even known existed before. 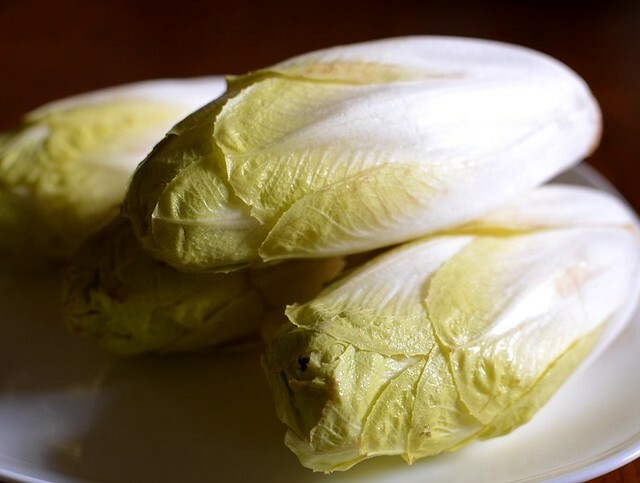 Belgian endive, known as witlof in the Netherlands, is not a veggie I grew up eating. Once in a while the salads on hotel buffet tables have some endive leaves tossed in them but I've never eaten them as a dish. With the limited ingredients in my daughter's little 1 meter kitchen, I caramelised endives in butter and sugar and we both found a new veggie to love. European veggies are undoubtedly more flavorful and tasty than Australian ones (American veggies aren't any better, I'm told by a friend back from California), and much cheaper too. Two Saturdays ago, I visited Lim Lee Seng Wholesaler in Penampang, near Supertanker Restaurant. I was allowed into their storage rooms, which was fun, because they were stacked to the ceiling with boxes of imported veggies, most of them from Australia. The 4-degree C temperature was a respite from the 35 C heat we are recently having. I came away with lush portebello mushrooms, asparagus, potatoes, a couple of cheeses and of course, endives. Prices at Lim's are about 30 to 40% cheaper than in supermarkets. 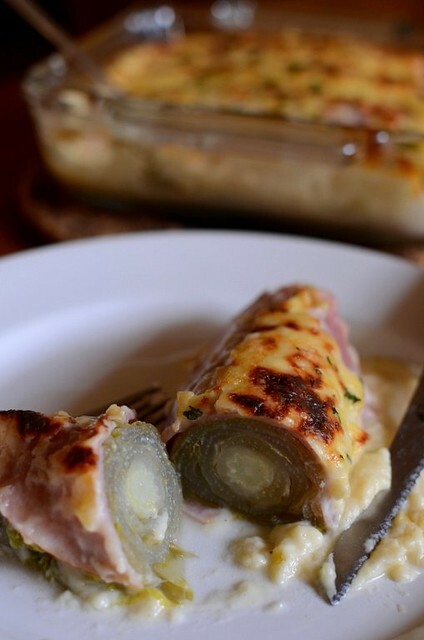 I think it was reader and blogger Lianne who told me about endive and ham au gratin, a very French way of cooking endives. The endives are sauteed or boiled until soft, then wrapped with a slice of ham each and topped with a white sauce of Gruyere cheese and baked. I bungled of course by typically cutting corners. Instead of sauteing the endives with sugar, I boiled them sans (as stated in the recipe in allrecipes.com) and I think that probably resulted in the endives tasting more bitter than expected. I didn't taste any bitterness in the endives I cooked in the Netherlands. The next time I cook this dish, I would simmer the endives in some butter and sugar before baking them. I'd also look for the whitest and smaller endives. Still, the dish turned out lovely and would've been even better, if not for the bitterness. In honesty, endives being so expensive here (RM35/USD11.70 per kg wholesale price) and lacking any particular flavor, I think this recipe would be just as good with other suitable veggies such as (of course) cauliflowers, potatoes, asparagus and yes, even Chinese cabbage. Belgian endives look like little Napa/Chinese cabbages with tapered tops but they are really a very different species because endives have a tuber root as big as the plant. The whiter the leaves of the endive, the less bitter it will be. Endives are grown in the dark and below soil level to prevent them from turning green and bitter. The ones I bought were too big and the leaves had too much color, probably because they weren't wrapped in paper to block out light. *I made too much sauce so this recipe is half of what I made. 1. If the endives are big, cut them each into half lengthwise. Put the endives cut sides down into a frying pan and add the stock, butter, sugar and 1/4 teaspoon of salt. Cover and simmer about 10 minutes for cut endives, 15 min for uncut. Let cool. 2. While the endives are being cooked, make the white sauce: Melt the butter (and oil if using) in a medium sized pot. Add the flour and stir well, about 3 minutes in low heat. Slowly drizzle milk into the flour-butter paste, stirring with a small whisk and adding more milk each time after the milk is absorbed. If you add the milk too quickly, the sauce will be lumpy (like mine) so be patient. Continue stirring until the sauce thickens. Remove from heat. Add 3/4 of the cheese and season with salt and pepper to taste. 3. Lightly press some of the liquid out from the endives. 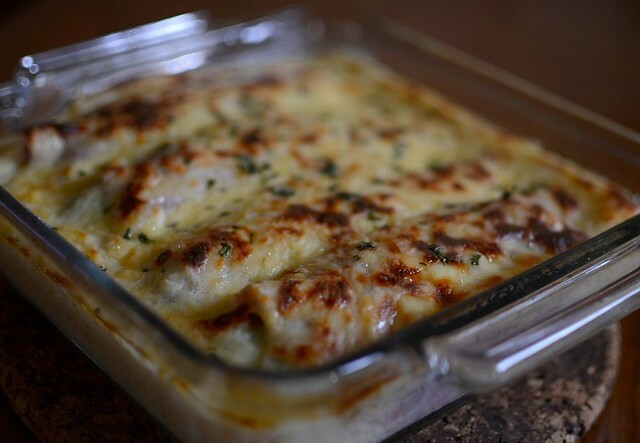 Wrap each endive with a slice of ham and place on a gratin dish. 4. Pour the white sauce over the wrapped endives, sprinkle with the remaining cheese and the parsley and bake for 25 minutes in a preheated oven at 220 C until golden brown. Serve hot. Hey Terri, great to see you trying this recipe :-D Strange that its bitter coz its the exact method I use. Hmmm ... maybe different variety?? lianne: i think the endives were to big and exposed to sunlight. i left them in my fridge drawers for a few days too so tt could've been another reason. how are you lianne:))? oh, thanks for telling me about this yummy dish. do tell me about more yummy dishes ok.
as i clicked on the "4 hungry comments" to comment, i just thought about how apt that satement was. this looks so so good. nv seen endive look so un-salady before! those are really tasty. I used to eat those a lot growing up in France. Too bad they are so expensive in the US. It's a simple and tasty dish. A tip. When you sautée your endives let them slightly burn a bit. That will give a nice caramelized touch. Sugar is only needed for endives which are bitter. Normally this is not needed in this dish as it is balanced due to other ingredients. Drain the liquid from your endives and DO NOT throw that away. If you add that to your bechamel sauce it adds a ton of flavor. Bon appetite!